It was a spectacular rally in the pre-historic city of Guwahati on January 23 last that strongly opposed the Indian Union government’s latest initiative to amend the country’s citizenship Act in favour of religious asylum seekers from Bangladesh, Pakistan and Afghanistan. Organized by the All-Assam Students’ Union (AASU) along with 30 indigenous groups at the historic Latashil play ground of Guwahati on the southern bank of mighty Brahmaputra, the demonstration witnessed vivid participation of thousands of people from different sections in the society. Not only Guwahati in the Brahmaputra valley of Assam, but most of northeastern localities presently witness an uproarious situation against the Bhartiya Janata Party (BJP)-led government in New Delhi. The region, surrounded by Nepal, Bhutan, Tibet (now under China), Myanmar and Bangladesh, has recently observed a Bandh (shut down) protesting against New Delhi’s adamant attitude to pass the citizenship amendment bill in the Lok Sabha and prepare to placing in the Rajya Sabha soon. For almost two years now, civil society groups and a large section of writer, artiste, media personalities etc. of the region have been opposing the move to grant citizenship to the religious asylum seekers from India’s neighbouring countries. They came out with clear demand that the Narendra Modi-led government’s move to benefit the Hindu, Sikh, Buddhist, Jain, Parsi and Christian asylum seekers must immediately be abandoned. Their logics include: Indian citizenship cannot be conferred on the basis of religion, as it is a secular country, and if done, it would go against the spirit of the Constitution. The other one, which has been supported by 95% of protesting organizations, argues that Assam has already taken the burden of numerous illegal migrants (from 1951 to 1971) and it should not get more migrants, as it would destroy the state’s demography and Assamese as a language. 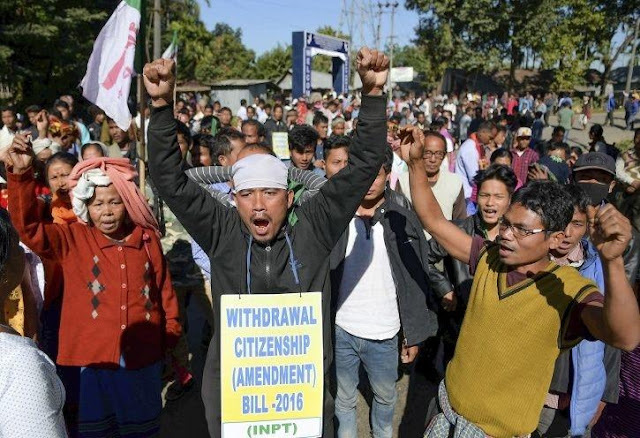 The protest gained momentum when the Joint Parliamentary Committee (JPC) on the Citizenship (Amendment) Bill 2016 arrived in Guwahati in May last year for public hearings. A number of indigenous organizations, local politicians, intellectuals, media personalities etc assembled on the venue and raised their voices against the bill. However, the subsequent hearing in Silchar of Barak valley witnessed a different picture as most of the organizations supported the initiative. When the Lok Sabha passed the bill on January 8, the anti-bill protests got escalated in the region. The local media were full of anti-bill statements, plentiful news related to agitations, along with long newspaper editorials and charged television talk-shows. Many political observers even started comparing the situation with another session of historic Assam movement in the making. The Assam agitation, launched in 1979 with the demand to detect and deport all illegal migrants (read Bangladeshi nationals) from the country, culminated after six years with an accord signed by the agitators with the Centre in presence of the then Prime Minister Rajiv Gandhi. Leaders of AASU and now defunct Asom Gana Sangram Parishad agreed to accept everyone entering Assam prior to March 25, 1971 as legal Indian citizens. The movement started with the ultimate goal to deport all illegal migrants on the basis of national cut-off year (1951) for which over 850 people sacrificed their lives and thousands others faced humiliations in different occasions. But the agitators, most of whom later became seasoned politicians, never tried to validate the accord with legal frameworks. Shockingly, the accord was never passed in Parliament for endorsement. The present-day movements have been led by AASU leaders along with the Northeast Students’ Organization and many Assam based ethnic civil society groups, where they maintain that Assam would burn if the bill is passed in the upper house of Parliament. AASU adviser Samujjal Bhattacharjya commented in various public meetings that the BJP-led governments in both New Delhi and Dispur had been hatching conspiracies to destroy the peaceful ambience of the region, as the bill would threaten the existence of indigenous people in the region. Lately two northeastern chief ministers belong to the BJP-led National Democratic Alliance family have come out raising voices against the bill. Meghalaya chief minister Conrad Sangma and Mizoram chief minister Zoram Thanga have opposed the initiative and asserted that they would not take any burden of foreigners in their states. Even Manipur chief minister and a senior BJP leader N Biren Singh expressed his concern over the probable negative implications of the initiative in his State. Arunachal Pradesh chief minister Pema Khandu and Assam chief minister Sarbananda Sonowal have supported the move, arguing that it would not affect the region. Remaining silent over the matter for months, Sonowal now start making voluminous public comments that the Centre’s new initiatives would never harm the local populations but benefit them in the long term. Sonowal stated that a section of vested interests was trying to create disturbances in Assam by spreading misinformation that 19 million Bangladeshi Hindu nationals would get citizenship as an immediate outcome of the bill. It cannot encourage any foreigner to come to India as the bill has a cut-off date of 31 December 2014, asserted the young chief minister. “The bill, if duly passed in Parliament, will simply allow the Hindus, Sikhs, Jains, Buddhists, Parsis and Christians to apply for citizenship after a mandatory residency of seven years. Once they apply, the citizenship applications will be verified by the local authorities,” stated Sonowal, adding that his government is duty-bound to protect the interests of indigenous communities of Assam. More blatant arguments were put by Himanta Biswa Sarma, the powerful minister in Sonowal’s cabinet, where he asserted that the citizenship amendment initiatives would help the local Assamese population. Expressing serious concern over the aggressive mentality of Bangladeshi Muslim settlers, Sarma claimed that the initiative would prevent Assam from becoming another Kashmir. “A nation should not have two separate cut-off years with one meant specifically for one province to detect illegal foreigners. Challenging the 1971 cut-off year, Asom Sanmilita Mahasangha has already approached the Supreme Court of India and the case is still pending. Few other organizations including Prabajan Virodhi Mancha are also raising voices against it,” said the PPFA statement, adding that it wants the apex court to settle the matter so that the issue can be resolved for good.